Myctophidae are a family of deep sea fish known as lantern fish. 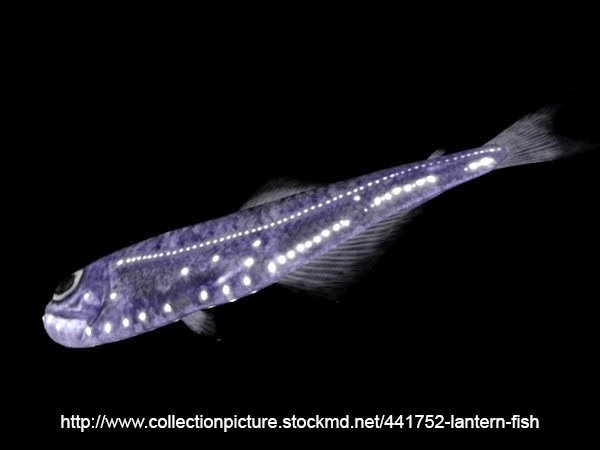 They are called lanternfish because of their tendency to light up like a lantern. As they live so far below the ocean surface that light cannot penetrate to their depth they need light patterns for sight to be useful in recognizing other members of the same species for mating. Some of these light patterns can be quite spectacular. Lanternfish are actually quite common in the deep ocean and probably make up the majority of the fish species down there. They are known to follow a classic diel vertical migration pattern. Lanternfish are found in all the world's oceans at depths of between 400 and 900 meters.